Business Courses and Training Programs by SVA and Priority®. SVA has been providing personnel training and business performance management services throughout the U.S. for more than 3 decades. We proudly offer the WorkingSm@rt® suite of training programs developed by Priority®, a credentialed series of in-person or online courses for business professionals to improve their skills to be more productive and effective. With a thorough portfolio of business training courses, including project and time management, selling and negotiating, and customer service training, the WorkingSm@rt® training programs can be instantly applied and deliver lasting results. Are you a manager? Contact us today about group rates for your employees. This is the workshop Microsoft chose when they wanted to train their own employees on how to use Outlook more effectively. 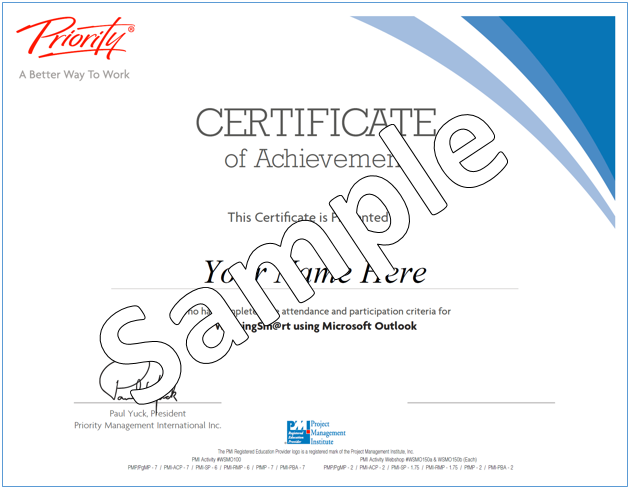 Graduates maintain increased productivity and enhanced on-the-job performance by knowing how to match the right process and skill sets when using their Outlook software. Effectively and accurately transfer execution plans developed through the Project Planning Breakthroughs method into MS Project. Use your software to manage the complexities of multiple projects more efficiently and effectively through the use of common resource pools and external dependencies, along with detailed reporting and updating. The key to success lies in the ability for teams to work together without the constraint of being together. It is now possible to collaborate with the rest of your team in a way that maximizes flexibility and minimizes the places you need to look to find key information or data. Find everything you need for a specific project or subject in OneNote book not your note book. Create, edit, organize, and enhance notes, and also integrate them with other applications using Microsoft OneNote. The WorkingSm@rt® 365 workshop is designed to help you develop the knowledge and the skills required to maximize your performance and productivity at work. At the end of the workshop, you will be better able to choose the right task, use the right tools and apply the right process to achieve great results. Enjoy a dramatic and immediate improvement in your ability to self-manage, applicable to any business... from the moment you learn it. Perfect for anyone who uses IBM notes. Whether you’re in the office or on the move, learn how to manage your time and priorities and consolidate personal, team, corporate and external information. Master the essential skills for Novell GroupWise and become your most productive. Attain control over activities and information to enhance personal and team productivity. Whether you’re in the office or on the move, learn how to consolidate personal, team, corporate and external information so you know when to act. If you have an iPhone®, iPad®, or other iOS device, we have the processes for increasing your productivity. We created this class to help individuals, teams, and companies to use these tools more effectively. Graduates of this class gain increased productivity and enhanced on the job performance by knowing how to match the right processes and skills when using their device. If you have a BlackBerry, we have the process for increasing your productivity. We created this class in conjunction with Research In Motion (creators of Blackberry) when the world’s largest distributor of BlackBerry devices wanted to train their employees to use this tool more effectively. Graduates of this class maintain increased productivity and enhanced on the job performance by knowing how to match the right process and skill set when using their BlackBerry. Turn your Google into an effective business management tool. We have the processes for increasing your productivity. This class is designed to help individuals, teams, and companies to use Google more effectively. Graduates of this class gain increased productivity and enhanced on the job performance by knowing how to match the right processes and skills when using their technology tools. How much time do you, your team, your company spend in meetings? Are your outcomes worth the cost? Are your meetings on time, on track, on purpose? This powerful, hands-on workshop is designed to give participants a practical process to ensure desired results. Learn not only how to plan, organize and run a successful meeting but also how to get the most out of the meetings you are required to attend. Learn to make effective choices when faced with increasing demands and responsibilities. Select the right tasks, at the right time, every time. Identify and focus on the goals and objectives that make the difference and learn to manage your activities for maximum results, acquiring the tools you need to make things happen. This workshop from our portfolio of Priority® business training courses will help you meet customer service objectives, exceed customer expectations, and achieve high levels of customer satisfaction. Customer service staff responsible for internal and external customer servicing play a pivotal roll in achieving your organization’s financial and marketing objectives. Each and every contact is a “moment of truth” for the customer. Imagine a process that can be immediately understood and successfully used by the whole team, regardless of how diverse the people, their locations, their departments, or the disciplines involved. This workshop from our portfolio of Priority® business training courses will help you develop advanced project planning skills to help you tackle the most challenging and complex projects. This workshop from our portfolio of Priority® business training courses will help you positively affect the outcome of all communications by mastering the skills used by those who influence at worldwide best practice levels. Human interaction is required to achieve business and personal goals. Our graduates learn to clearly read each situation, ask the right questions, listen well, understand the issues at a deeper level, and communicate with confidence. This workshop from our portfolio of Priority® business training courses will help you unleash the potential that training sets up. Through regular consultation, the coach helps staff leverage their skills training to optimum levels by providing the necessary motivational environment, expectation, and support. This workshop from our portfolio of Priority® business training courses will help you learn and understand a proven selling process that allows someone to buy a business solution instead of being sold a product or service. Everyone makes a living by selling someone something…whether it’s a product, a service or even an idea! Knowing what, why, how and when your audience wants to buy is the secret to making that sale successful, and the first step to keeping the customer satisfied... for life. Make outbound sales calls more effective while building strong customer relationships for your company. This workshop from our portfolio of Priority® business training courses will help to ensure that inside sales people at small and medium size businesses proactively plan, manage, and implement selling campaigns by phone that generate revenue for the company and leave a lasting, positive impression with your customers. This workshop from our portfolio of Priority® business training courses will help you create lasting partnerships and measurable improvements that result from mutually successful negotiations. Once participants learn how to transform potential combatants into lasting partners, they significantly increase their confidence to enter any negotiation. management, planning, profiling, territory analysis, prospecting and influencing. This workshop from our portfolio of Priority® business training courses will help you gain an in-depth understanding of the complexities that exist within the servicing requirements of customers designated as Key Accounts, and use the strategic and tactical tools and processes to achieve the customer – supplier relationship required. Key Account Managers are responsible for an organization’s major, national, and international accounts. Many are moving their customers relationships into preferred, sole or partnership status. This workshop from our portfolio of Priority® business training courses will help you learn to focus your resources to achieve the results you want. Graduates of this workshop make the right choices when faced with increasing demands and responsibilities. They select the right tasks, at the right time, every time. Send us a message. Someone will respond to you quickly. See more detailed course information below.